Leptin is a 16 kDa peptide hormone with the tertiary structure of a cytokine that is highly conserved among mammalian species . It is structurally and functionally related to the IL-6 cytokine family. Leptin functions as a signal in a feedback loop regulating food intake and body weight . The leptin receptor Ob-R (or Lepr), is a member of the class I cytokine receptor family, which includes gp-130, the common signal transducing receptor for the IL-6 related family of cytokines . Alternative splicing of the leptin receptor gene produces at least six transcripts designated Ob-Ra through Ob-Rf (Figure 1) . Two of the isoforms have been described in only one species each, Ob-Rd in mice and Ob-Rf in rats . In humans, only expression of Ob-Ra, Ob-Rb and Ob-Rc mRNA has been reported . Ob-Re is a secreted isoform of the receptor, lacking transmembrane and cytoplasmic domains. In humans, transcripts corresponding to Ob-Re have not been described, but soluble leptin receptor protein can be generated by proteolytic cleavage of the Ob-Rb and Ob-Ra isoforms . Structure and isoforms of mouse leptin receptor. Ob-Rb contains the longest intracellular domain, which is crucial for leptin signaling. 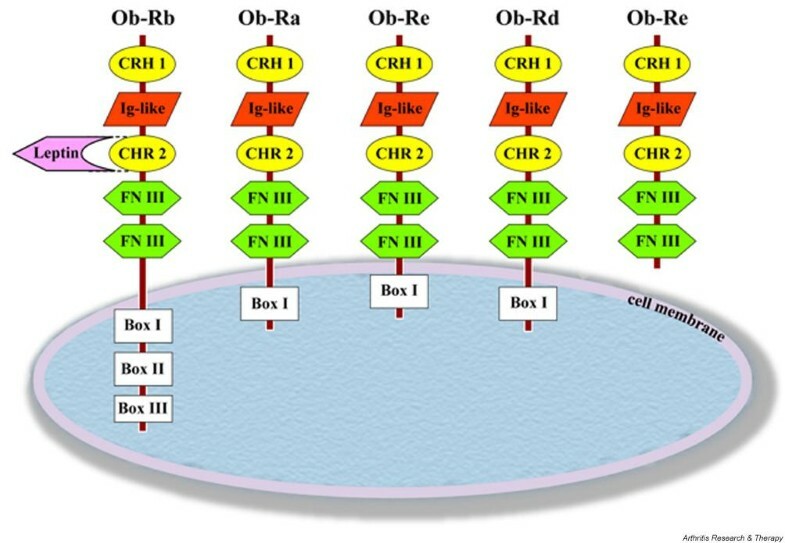 Ob-Ra, Ob-Rc and Ob-Rd contain only short cytoplasmic domains. Ob-Re is a secreted isoform of the leptin receptor, lacking transmembrane and cytoplasmic parts. Cytokine receptor homology module (CRH)2 is the main binding site for leptin on the Ob-R. The Ig-like and the FN-III domains are critically involved in Ob-R activation. The role of CRH1 remains to be determined [111, 112]. FNIII, fibronectin type III domain; Ig-like, immunoglobulin-like fold. Ob-Rb is abundantly expressed in the hypothalamus, an area in the brain involved in the control of food intake. The anorexigenic effect of leptin is dependent on binding to the long form of its receptor, Ob-Rb . Both leptin-deficient (ob/ob) and leptin receptor (Ob-Rb)-deficient (db/db) mice display a severe hereditary obesity phenotype, characterized by increased food intake and body weight, associated with decreased energy expenditure . Administration of leptin reverses the obese phenotype in ob/ob mice, but not in db/dbmice, and decreases food intake in normal mice. Lack of response to leptin is also well described in obese Zucker rats, which bear a mutation (fa) in the leptin receptor gene . Mutations in leptin and Ob-R genes associated with obesity have also been described in humans [10, 11]. Leptin is produced predominantly by adipocytes, although low levels have been detected in the hypothalamus, pituitary , stomach , skeletal muscle , mammary epithelia , chondrocytes  and a variety of other tissues . Plasma leptin concentrations correlate with the amount of fat tissue and, thus, obese individuals produce higher levels of leptin than do lean ones . The correlation between serum leptin concentrations and the percentage of body fat suggests that most obese people are insensitive to endogenously produced leptin . In addition to the regulation of appetite and energy expenditure, leptin exhibits a variety of other effects [19–22]. Consistently, ob/ob and db/db mice are not only severely obese, but display also several hormonal imbalances, abnormalities in thermoregulation, increased bone mass, infertility, and evidence of immune and hematopoietic defects [17, 19, 20, 22–25]. In humans, congenital leptin deficiency is associated with hypogonadotropic hypogonadism, morbid obesity and frequent deaths due to infections [11, 26]. In addition to the central role of lipid storage, adipose tissue has major endocrine functions and releases a variety of pro-inflammatory and anti-inflammatory factors, including adipo-cytokines, such as leptin, adiponectin and resistin, as well as cytokines and chemokines. Altered levels of different adipo-cytokines have been observed in a variety of inflammatory conditions (reviewed in ) and, in particular, the role of leptin in immune responses and inflammation has lately become increasingly evident. Altered leptin production during infection and inflammation strongly suggests that leptin is a part of the cytokine cascade, which orchestrates the innate immune response and host defense mechanisms [28, 29]. Like other members of the IL-6 family, leptin was shown to activate the Janus kinase/signal transducer and activator of transcription (JAK/STAT) pathway (Figure 2) . Leptin also induces the expression of the suppressor-of-cytokine signaling (SOCS)-3, which inhibits STAT signaling . In addition, stimulation of leptin receptor triggers activation of phos-phatidylinositol 3-kinase (PI3K) and mitogen-activated protein kinase (MAPK) . Activation of these pathways is also characteristic for the signaling of other cytokines belonging to the IL-6 family . Physiological levels of leptin can modulate the response to an inflammatory challenge by altering production of proinflammatory and anti-inflammatory cytokines and may also affect cytokine signaling by a variety of mechanisms, including induction of SOCS-3 . Mechanisms of leptin signaling. Upon leptin binding to Ob-Rb, the Janus kinase/signal transducer and activator of transcription (JAK/STAT), mitogen-activated protein kinase (MAPK)/extracellular signal-regulated kinase (ERK) and phosphatidylinositol 3-kinase (PI3K) pathways are activated. Akt, protein kinase B; Grb-2, growth receptor-bound-2; IRS, insulin receptor substrate; MEK, mitogen-activated protein kinase kinase; PIAS 3, protein inhibitor of activated STAT3; Raf, MEK-kinase; Ras, G-protein; SHP-2, SH2-domain containing protein tyrosine phosphatase; SOCS3, suppressor of cytokine signalling-3. In vitro studies revealed that Ob-Rb is expressed in T and B cells, macrophages and hematopoietic cells and direct effects of leptin on those cells have been demonstrated [34–41]. Moreover, activated T cells themselves have been shown to express and secrete leptin, which sustained their proliferation in an autocrine loop . However, a recent study indicated that T cell-derived leptin does not play a major role in the regulation of the inflammatory process in experimental models of hepatitis and colitis in mice, emphasizing the critical role of adipose tissue-derived leptin in immune modulation . Some studies report increased levels of leptin during infectious and inflammatory processes. Leptin expression in adipose tissue and circulating leptin levels are increased after administration of inflammatory stimuli such as lipopolysaccha-ride (LPS) or turpentine to hamsters [44, 45]. Endotoxin has also been shown to stimulate the release of leptin into peripheral blood in human and nonhuman primates . LPS, as well as proinflammatory mediators such as tumor necrosis factor (TNF)-α and IL-1, increase the expression of leptin mRNA in adipose tissue  and a statistically significant elevation of plasma leptin concentrations has been demonstrated in adult septic patients compared with healthy subjects [47–50]. However, other studies have not found increased leptin levels in inflammatory conditions, including acute experimental endotoxemia in humans, HIV infection and newborn sepsis [51–53]. Moreover, in tuberculosis patients, plasma leptin concentrations were significantly reduced . Similarly, decreased circulating levels of leptin were observed in mice following intravenous injection of Staphylococcus aureus . Increased leptin production is thus observed in inflammatory conditions in many, although not all, animal models and diseases examined. The increased sensitivity of leptin-deficient rodents to pro-inflammatory, monocyte/macrophage-activating stimuli, suggests a role for leptin in the regulation of inflammatory responses (Table 1) . Ob/ob, as well as fasted wild-type mice, which display decreased leptin levels, are significantly more susceptible to LPS-induced lethality, and this phenotype was partly reversed by the administration of leptin [57, 58]. Similarly, ob/ob, db/db and fasted wild-type mice are more likely to succumb after the administration of TNF-α. This phenotype was again reversed by leptin treatment in ob/ob and wild-type, but not in db/db, mice [58, 59]. The protective role of leptin against TNF-α-induced toxicity was further supported by the deleterious effect of neutralizing anti-leptin antibodies administered to TNF-α-injected mice . Ob-R-deficient fa/fa rats also displayed enhanced sensitivity to LPS-induced hepatotoxicity . Dysregulation in cytokine induction after LPS stimulation may contribute to the increased susceptibility to LPS toxicity, as demonstrated in a number of experimental studies in transgenic and gene knockout animals. Lower levels of anti-inflammatory cytokines, such as IL-10, and IL-1Ra, and higher levels of the proinflammatory cytokines IL-12, IL-18 and interferon (IFN)-γ have been detected after LPS injection in ob/ob mice [57, 60, 61]. Consistently, protective effects of leptin demonstrated in a model of experimental pancreatitis were attributed to increased IL-4 production and to reduced serum TNF-α or IL-1β [62, 63]. Anti-inflammatory effects of leptin were further demonstrated by reduced TNF-α and IL-6 responses in endotoxin treated primates . Taken together, these different observations are mostly consistent with the notion that leptin deficiency constitutes a proinflammatory state. Up and down arrows indicate increase and decrease, respectively. ip, intraperitoneal; iv, intravenous; LPS, lipopolysaccharide; ob/ob, leptin deficient mice; Ob-R, leptin receptor; SAA, serum amyloid A; TNF, tumor necrosis factor; WT, wild-type. 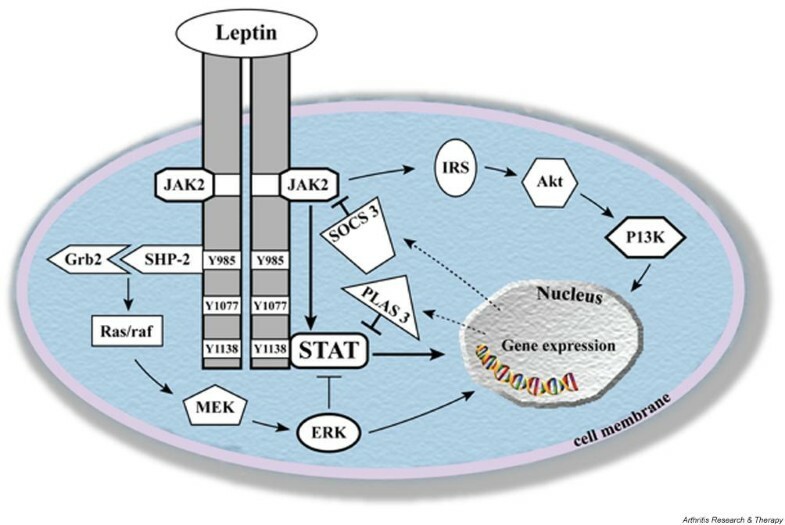 The role of leptin in the regulation of important macrophage functions is further emphasized by alterations in the phenotype of those cells during chronic leptin deficiency. Impaired phagocytic functions resulting in reduced bacterial elimination have been described for macrophages from leptin-deficient mice during infections with Escherichia coli, Candida albicans and Klebsiella pneumoniae (Table 1) [64–66]. In addition to modulating phagocytosis and cytokine production by macrophages, leptin has recently been shown to regulate other aspects of the innate immune response. Leptin was indeed reported to enhance oxidative species production by stimulated polymorphonuclear leukocytes (PMNs) , whereas another study provides evidence that leptin inhibits neutrophil migration in response to classical chemoattractants . These findings, as well as an increased rate of death due to infections among leptin-deficient individuals , suggest that leptin contributes to host defense against microorganisms. Several recent studies demonstrated that PMNs express the short (Ob-Ra), but not the long isoform Ob-Rb. Whether Ob-Ra can deliver intracellular signals or not remains a matter of debate [67–69]. For instance, the effect of leptin on CD11b expression in neutrophils is likely to be indirect and mediated by the induction of TNF-α production by monocytes . In contrast, it was reported that leptin directly activates neutro-phils and delays spontaneous apoptosis of these cells by inhibiting proapoptotic events proximal to mitochondria, the effect being mediated via PI3K and p38 MAPK signaling pathways . In general, leptin thus appears to increase the activity of phagocytes and may thereby contribute to efficient host defense. Leptin was reported to stimulate the proliferation of T cells in vitro, to promote T helper (Th)1 responses and to protect T cells from corticosteroid-induced apoptosis [38, 39]. Ob/ob mice display a higher level of thymocyte apoptosis and reduced thymic cellularity compared to control mice and these effects were reversed by peripheral administration of recombinant leptin . In the same study, wild-type mice treated with leptin during a 48 hour fast were completely protected against the profound thymic atrophy observed in non-treated fasted mice . Ob/ob mice also exhibit defective cellular and humoral immune responses and are protected from immune-mediated inflammation in various models, such as experimental colitis, T-cell mediated hepatitis, glomeru-lonephritis and experimental autoimmune encephalomyelitis (EAE), an experimental model for multiple sclerosis (Table 2) [19, 28, 70–74]. Leptin replacement in ob/ob mice converted resistance to EAE into susceptibility and this effect was accompanied by a switch from a Th2 to a Th1 pattern of cytokine release and consequent reversal of Ig subclass production . Likewise, administration of leptin to EAE susceptible mice after disease onset increased the severity of the symptoms and leptin administration accelerated type 1 diabetes development in NOD mice [73, 75]. Conversely, blockade of leptin with anti-leptin antibodies or with a soluble mouse leptin receptor chimera, either before or after onset of EAE, ameliorated the clinical symptoms, inhibited antigen-specific T cell proliferation, and switched cytokine secretion toward a Th2 and T regulatory profile . Up and down arrows indicate increase and decrease, respectively. Abs, antibodies; AIA, antigen-induced arthritis; db/db, leptin receptor deficient mice; EAE, autoimmune encephalomyelitis; ob/ob, leptin deficient mice; Th, T helper; TNF, tumor necrosis factor; WT, wild-type. Starvation and malnutrition are associated with reduced leptin levels and alterations of the immune response, which can be reversed by leptin administration [39, 40, 77]. Acute starvation, which is able to prevent increases in serum leptin, delayed EAE onset and attenuated clinical symptoms . Furthermore, in humans, leptin deficiency was associated with reduced numbers of circulating CD4+ T cells and impaired T cell proliferation and cytokine release, all of which were reversed by recombinant human leptin administration . In vitro, leptin dose-dependently enhances proliferation and activation of human circulating T lymphocytes when they are costimulated by phytohemagglutinin or concanavalin A and modulates CD4(+) T lymphocyte activation toward a Th1 phenotype by stimulating the synthesis of IL-2 and IFN-γ . Finally, human dendritic cells express leptin receptors and leptin down-regulates their IL-10 production and drives naive T cell polarization towards a Th1 phenotype . In view of these different observations, leptin thus seems to display a stimulatory effect on adaptive immune responses and to favor Th1 polarization. Taken together, the experimental data collected suggest that chronic leptin deficiency differently affects adaptive versus innate immune responses: adaptive immune-mediated responses are attenuated whereas, in experimental models involving the innate immune response, leptin deficiency causes inadequate control of the inflammatory response. As already mentioned, leptin and its receptor share some homologies with the IL-6 and IL-6 receptor families, respectively . Interestingly, many similarities can be observed also in the pattern of leptin and IL-6 effects during adaptive or innate immune response-mediated inflammation. IL-6 exerts deleterious actions in many models of chronic immune mediated inflammation, whereas it has been shown to possess protective effects in some models of innate immune response-mediated inflammation . As mentioned above, leptin exerts various direct effects on cells involved in the immune and inflammatory responses. However, the connection between leptin, immune responses and inflammation in vivo is complex. Indeed, leptin/leptin receptor deficiency causes multiple neuroendocrine and metabolic modifications in ob/ob or db/db mice, including the activation of the hypothalamic-pituitary-adrenal axis and hypercorticosteronemia, hyperglycemia and diabetes, which may also indirectly affect the immune system. Similarly, leptin deficiency after starvation in rodents is linked to increased glucocorticoid levels, and decreased levels of thyroid and growth hormone, each of which may mediate immune suppression [77, 82–84]. Numerous neuroendocrine defects have been also reported in human leptin-deficient patients. These include decreased symphathetic tone, elevated thyroid stimulating hormone, parathyroid hormone, cortisol and adrenocorticotropic hormone (ACTH) levels, abnormal growth hormone stimulation, thyroid function, and others , which could indirectly contribute to the development of immune system dysfunction in those patients. All these data underscore the potential importance of both direct and indirect effects of leptin or leptin deficiency during immune response and inflammation. In addition, leptin deficiency results in morbid obesity and multiple immunomodulatory functions have been recently described for adipose tissue [85–87]. In fact, obesity itself may represent a low grade systemic inflammatory state and could thus favor different immune and inflammatory responses. To investigate the relative contributions of direct and indirect effects of leptin on the immune system in a normal environment, we recently generated bone marrow chimeras by transplantation of leptin receptor-deficient db/db bone marrow cells into wild-type recipients (GP and CG, manuscript submitted). The size and cellularity of the thymus, as well as cellular and humoral immune responses were normal when db/db bone marrow was grafted into wild-type mice. Direct effects of leptin on lymphocytes are thus not necessary for T cell maturation and immune response in a normal environment. Conversely, thymus weight and cell number were decreased in the reverse graft setting when wild-type bone marrow was transferred into db/db mice, indicating that expression of the leptin receptor in the systemic and/or local environment is mandatory for T cell development. Based on these observations, it appears that in mice major effects of leptin receptor-deficiency on the immune system are indirect. Interestingly, in contrast to leptin or leptin receptor-deficient rodents, in human patients, gradual compensations of several endocrine functions that were initially impaired due to a mutated leptin molecule were observed, possibly due to the longevity of humans . The authors suggest that, over a time span of several decades, other factors seem to bring back to normal functions that were initially dysregulated in the absence of leptin, such as thyroid axis activity, reproduction, and possibly immunity. These observations further emphasize the complexity of the neuroendocrine regulatory and compensatory mechanisms in leptin-deficiency. A potential role of leptin has been recently investigated in several models of arthritis depending on acquired or innate immune responses. Antigen-induced arthritis (AIA) is an experimental model of rheumatoid arthritis (RA), which is based on the induction of a local Arthus reaction by intra-articular injection of methylated bovine serum albumin (mBSA) into the knee joint of mBSA-immunized mice. Ob/ob and db/db mice had a milder form of AIA than their lean littermates . In addition, ex vivo proliferation and IFN-γ production following the stimulation of lymph node cells by mBSA were significantly reduced in ob/ob and db/db mice. In contrast, IL-10 production by lymph node cells from ob/ob and db/db mice was increased . The levels of anti-mBSA antibodies were also decreased in immunized ob/ob and db/db mice compared to their controls. These results indicate that leptin contributes to joint inflammation in AIA by regulating both humoral and cell-mediated immune responses. To investigate a potential effect of leptin on inflammatory events in the joint, we explored the role of leptin in zymosan-induced arthritis, a mouse model of arthritis that is not dependent on the adaptive immune response. This model relies on intra-articular injection of zymosan A, which is a ligand for toll-like receptor 2, as well as an activator of the alternative complement pathway, and which triggers a local activation of the innate immune system, causing inflammation of the injected joint [88, 89]. We observed that both ob/ob and db/db mice exhibited a delayed resolution of the inflammatory process and an increased acute-phase response during zymosan-induced arthritis compared to their lean littermates . It is noteworthy that this increased inflammatory response was observed in ob/ob and db/db mice, despite the presence of elevated glucocorticoid levels. This observation is in agreement with data obtained in another study, where treatment of wild-type mice with leptin caused a significant decrease in the severity of septic arthritis induced by S. aureus, which also strongly depends on innate immunity . Overall, the data obtained in experimental models of arthritis suggest that, like in other experimental disease models, chronic leptin deficiency differently affects acquired versus innate immune responses: adaptive immune-mediated responses are attenuated, whereas in models involving the innate immune response, leptin deficiency causes inadequate control of inflammation. As described above, leptin contributes to adaptive immunity-mediated inflammation in different models in rodents (Table 2). However, studies in humans show more controversial results. A potential role of leptin in RA, one of the most frequent immune-mediated inflammatory diseases in humans, has been investigated in several studies (Table 3). Only a couple of studies so far demonstrated elevated leptin concentrations in RA patients . One of those studies showed increased plasma levels of leptin in RA patients compared to healthy controls, associated with significantly lower leptin levels in matched synovial fluid samples . However, the lack of data concerning the body mass index (BMI) limits interpretation of the results of this study . In another study, gender distribution differs between the groups (male:female ratio in RA patient group is 9:22, whereas in healthy controls 8:10) . Plasma leptin levels are more than twice as high in healthy females than in males of corresponding weight status ; therefore, interpretation of these data is also limited. In addition, the only indication regarding disease activity in both these studies is measurement of C-reactive protein (CRP) levels, which either correlates  or not  with serum leptin levels. BMI, body mass index; CRP, C-reactive protein; RA, rheumatoid arthritis; SLE, systemic lupus erythematosus; TNF, tumor necrosis factor. Moreover, two other studies showed that serum levels of leptin were not increased in RA patients compared with controls and the only correlations observed were between leptin and BMI or the percentage of body fat [94, 95]. Yet another study showed even lower plasma leptin levels in RA patients than in controls and leptin did not correlate with BMI, CRP, total fat mass or disease activity score . Finally, a significant inverse correlation was found between inflammation and leptin concentrations in one study on patients with active RA, although plasma leptin concentrations did not significantly differ from those in healthy controls . Short course anti-TNF-α treatment did not modify leptin concentrations, despite significant reductions of CRP and IL-6. It was reported that fasting leads to an improvement of RA activity associated with a marked decrease in serum leptin and a shift toward Th2 cytokine production , reminiscent of the features observed during antigen-induced arthritis in ob/ob mice (Table 2). However, after a seven day ketogenic diet in RA patients, there were no significant changes in any clinical or biological measurements of disease activity, despite a significant decrease in serum leptin concentrations . In conclusion, in the light of the present controversial data, it seems difficult to make an unambiguous conclusion about a potential role of leptin in RA. Several studies suggest a potential implication of leptin in the pathogenesis of other autoimmune inflammatory conditions in humans. However, the results of these studies do not consistently show a correlation between leptin levels and activity of immune-mediated diseases (Table 3). In patients with multiple sclerosis, serum levels of leptin were comparable to those of healthy controls [100, 101]. Nonetheless, variable effects of IFN-β treatment on leptin levels were reported in two studies. In the first study, circulating leptin levels were increased before clinical exacerbation in relapsing patients and significantly decreased after IFN-β treatment . In another study, leptin levels were increased in IFN-β treated patients compared to untreated controls during both active disease and remission . Moreover, leptin induced secretion of IL-10, an anti-inflammatory cytokine, by peripheral blood mononuclear cells from multiple sclerosis patients in culture. Elevated serum levels of leptin were found in women with systemic lupus erythematosus . However, leptin levels correlated with BMI, but not with disease activity, as assessed by the Mexican SLE disease activity index. In contrast, in systemic sclerosis patients, decreased serum leptin levels were found . There was no correlation between serum leptin levels and the duration of the symptoms of systemic sclerosis, while serum leptin levels correlated with BMI. In 35 patients with Behçet's syndrome, leptin levels were significantly higher than in healthy controls and correlated positively with disease activity . Finally, some investigations suggest an association of leptin levels with several inflammatory markers, such as soluble TNF receptors [105, 106] or CRP in healthy humans . However, several recent clinical studies failed to demonstrate an effect of leptin administration on proinflammatory markers in healthy lean or obese humans [105, 108, 109]. Taken together, the results of these different studies do not consistently show a correlation between leptin levels and activity of immune-mediated disease. In addition, although circulating leptin levels correlated with inflammatory markers in some studies, there is no evidence for pro-inflammatory effects induced by leptin administration. Taken together, results of in vitro and experimental animal studies suggest that leptin acts mostly as a proinflammatory agent during adaptive immune responses, whereas in processes involving innate immunity, anti-inflammatory effects of leptin are prevalent. However, it is difficult to elucidate the role, if any, of leptin during inflammatory conditions in human patients as different clinical studies have so far yielded inconsistent results, suggesting that leptin has a rather complex role in immune response and inflammation in humans. In particular, indirect effects of leptin or leptin deficiency are likely to considerably influence immune responses and inflammatory processes, and potentially opposite direct and indirect effects of leptin might thus partly account for some controversies observed in different investigations. CG is supported by a Swiss National Science Foundation grant (320000-107592) and GP is supported by grants from the De Reuter and the Academic Society Foundations (Geneva, Switzerland). EB drafted the manuscript. GP and CG participated in discussions and manuscript revisions.